Is There a Market for the Invention? Thomas Edison is an inventor famous for his long running electric light invention among many others. Edison accumulated over 1000 patents in his life time. 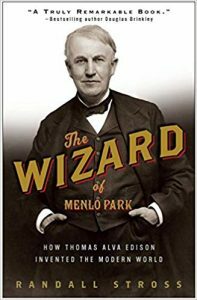 His life and work is covered in Randall Stross’ book The Wizard of Menlo Park: How Tomas Alva Edison Invented the Modern World. Early in his career, while working as a telegraph operator, Edition invented on the side. 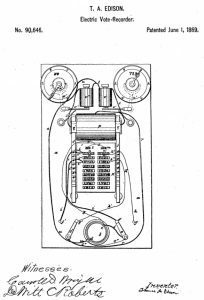 According to Stross, “Edison filed patent applications as fast as the ideas arrived.” The first patent application that Edison filed was for a legislative chamber vote recorder (U.S. Patent No. 90,646). The vote recorder could shorten the time it took to tabulate votes by hours. The invention provided buttons at each member’s desk and the chamber’s speaker could see running totals for “aye” and “nay” on twin dials. Next PostNext Will They Steal My Invention?